Several articles have been collected and presented here to honor Twyla Olmstead and the contribution she has given to the Median Iris Society. Which Extra Did I Send Last Time? Marie and I (Tell Muhlestein) had an exciting few moments as we entered Hotel Benson, Convention headquarters, - seeing many familiar faces and meeting others whom we had only known through correspondence, and as we met the committee in charge of registrations, we were told there was a note for us which read: "Dear Marie and Tell, may I meet you? Twyla Olmstead" But where was she in all that crowd? We had her paged and at last met her face to face. For those of you who may not know, Twyla does the little SQUIGGLES (Cartoons) for my catalog and has done this since 1955. We very much enjoyed getting to know Twyla, and I believe she met quite as many convention-goers as anyone else in attendance. 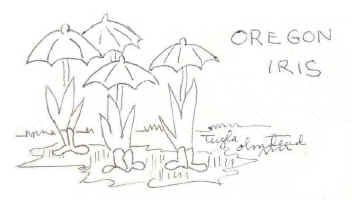 While we luncheoned at one place Twyla quickly "hatched" a Squiggle showing Oregon-irises wearing boots (instead of rhizomes, I suppose) and having, instead of flowers, umbrellas on their stalks. for Marie and me to say goodbye to this special friend who has given so freely of her talents to dress-up and give humor to our "little check list". Truly, Twyla is a woman of quiet charm, spirituality and great talent. If it were her nature to want worldly gain she could easily achieve all this for she has what the art and advertising world needs. Her joy is in service to her fellow beings and her church. It was a source of satisfaction to see how well she had recovered from her many serious hospital experiences, and to see her walking as though she had never known serious bone surgery. Many people contribute to the iris world in unique and unexpected ways. (Witness all those charming, bouncy Medianite covers drawn by our own charming, bouncy Susan Smith, for example.) But no one's contributions to the iris world bring a broader smile than the Squiggles that are the work (or play) of Twyla Rogers Olmstead. 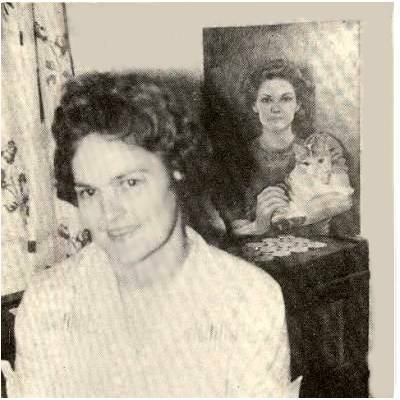 This talented artist and amazing woman did her amusing cartoon drawings for The Medianite mostly in 1961. She's done others for various uses since, of course, but we'd lost track of her and vice versa. The drawing started from my first memory,"Twyla says. 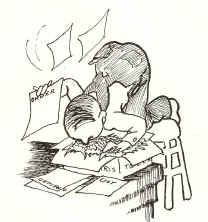 "I don't know a time when I began, but the Squiggles grew from World War II sketches on the backs of letters. I was told that they were watched for at mail-call. And after that they just hatched out the end of my pen-point, getting bodies and captions as necessary." Tell Muhlestein was the first one to encourage the Squiggles, Twyla recalls. Bee Warburton then asked Twyla to contribute Squiggles to The Medianite, and some classic iris cartoons were born. "When Tell died, it took the heart out of me a lot," Twyla says. "I've also lost Tell's wife's address, and I wish I knew it. The last time I was at the Schreiners' Garden, I gave the originals to Bob. He seemed to cherish them, and I knew I had no one to pass them on to." A mouse had eaten all Twyla's old Medianites in storage during one of the Olmsteads' many moves. So the cartoons became just a fond memory. "I recently found some old ones in a scrapbook of my mother's, though," Twyla comments. And now they're being revitalized after Jim Morris tracked down the Olmsteads' address and wrote to ask permission to use them again. So Twyla has even drawn some new Squiggles, and we look forward to making irisarians smile with them again. How Twyla finds the time to do them is another wonder. `Busy' doesn't begin to describe this lady's life-she may be the prototype for the Superwoman' concept. I have reached 78 years, to my amazement. Had I driven a car as I have this body, it would long ago have been in the junk-yard," Twyla laughs. "But perhaps as my doctor said, a sense of humor has preserved me. To tell you what's happened since 1961 would take a book and read like a soap opera script." A first move became mandatory when a car race track replaced the former garden fields behind their house with noise, debris, and undesirable neighbors. They bought an acreage with an ancient log house in 1964. Twyla did timber clearing, road building, and fencing "the hard way" while husband of 49 years, Earl, "worked at the mill and provided the funding." I sweated out the Columbus Day hurricane in the log house," Twyla remembers. "It plucked the roof like a chicken and destroyed a lot, uprooting 40-year old trees." That's also where she fell through the barn floor, and had to set her own leg to get out of the hole, get in the car and drive to the hospital. "It messed up the joint," she notes. "Plus an attack on me and my dogs by a stray pit-bull ended with my having osteomyelitis. (That dog was SERIOUS about killing me!) I spent about seven trips to surgery, in between the sawing and hammering and cement work." Their current home since 1972, a 9-room Victorian in Castle Rock, built in 1905, has taken a lot of renovating and redecoration. "We have a lot and a half, with the house taking up much of it, so vegetables have gradually given way to irises for room. Of course, you know what the Mt. St. Helen's volcano did to us here," she reminds. "If the crow was looking where he was flying it would be 34 miles away." She continues on the town Planning Commission and so many activities it would leave you weak. "I firmly believe there is work for me still to do," she states. And in spite of it all, Twyla has never lost her interest in irises. "I have quite a few listed in a recent Medianite AACHEN ELF, BOO, BUMBLEBEE, DEELITE, FROSTED VELVET, PINK BUBBLES, BATIK, JOHN, CHERRY, PETITE BALLET, and others from Opal Brown....One I love called KENTUCKY BLUE GRASS, and LITTLE BIG HORN... but in looking at the lists that "GREEN-EYED SHEBA" intrigues me where can I get that? My doctor told me I would be pushing it to go to the Portland (AIS) Convention," Twyla reports. “They had taken a cat-scan for another problem and found an aortic aneurysm ready to blow. I had already paid the fees, so I told him to get the show on the road because I had a convention to go to, and I only had two weeks to recover! If you were at the Convention, you may have seen me, unawares. I had embroidery "thread painted" iris on a sweatshirt and a dress, and many people asked me about them. I didn't see any hybridizers from the old days that I knew, and was feeling lost, certain that I'd long been forgotten. But when Mr. Lowe found me at one of the gardens and asked me to draw him a Squiggle on a scrap of paper, he was so happy with it that it made my whole day. "If traffic allows and the Lord is willing, I'd like to attend the Median Fix," Twyla muses. 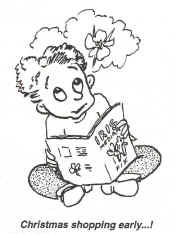 "I don't travel too far anymore, but it sounds like the proverbial "carrot in front of the mule I want to see...."
Regular readers of The Medianite are familiar with the delightful "Squiggles" cartoons by Twyla Olmstead. And those attendees of Median Fix in `96 saw the thread-painted navy blue vest with PELE, JADE STONE, and four other median irises in spectacular coloration. The vest was also displayed at the 1998 AIS Convention in Denver. Twyla has very generously donated this one-of-a-kind vest (plus sweater and pants) to the Median Iris Society as a fund raiser. The MIS Board decided to accept bids at the 1998 Convention, continue bidding via The Medianite, and finalize the process with a silent auction at the 1999 AIS Convention in Oklahoma City, OK, May 4-8. The thread-painted vest will fit male or female, medium to large. The matching navy pants (women's size 18) are 100% polyester, machine washable, and with the acrylic white sweater, make an attractive complete outfit. It has been estimated that the vest entailed between 500 and 700 hours of hand needlework. At the current U.S. minimum wage of $5.15 per hour, you are looking at a labor of love of $2,575 to $3,605! Twyla is no longer able to stitch or even to write. The hands that did so much can hardly hold a spoon, but her mind is still creative and thinking of others. Twyla wishes us luck with our fund raiser, and said since Iris means rainbow, she will see us "somewhere over the rainbow". I only knew her for three of her 81 years, but she brightened my life with her "Squiggles" cartoons. 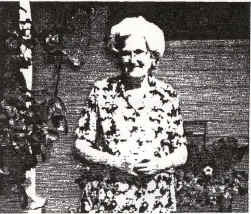 Twyla Evvon Rogers-Olmstead died November 15, 1998, at her home in Castle Rock, WA. She was born June 27, 1917, in Freewater, OR. Her parents came to Longview by covered wagon over Oregon's Blue Mountains, following part of the old Oregon Trail. The Medianite featured Twyla and her Squiggles in its Winter 1995-96 issue (see "The Woman Behind 'Squiggles"', pp. 54-55). I treasured our three years of correspondence because each note or letter brought additional Squiggles, sometimes on the back of the envelopes - just like the World War II sketches she sent soldiers that they watched for at mail-call. At Median Fix '96 in Portland she was surprised when I introduced her at the banquet. I remember how happy she was to be among median iris people. And everyone who was there remembers her fabulous thread-painted vest of median irises. As she became incapacitated, Twyla sent me Median Robin No.3 from 1961 in which she shared hybridizing notes with Bee Warburton, Molly Price, Peg Edwards and Peggy Burke Grey. Last bloom season she got to see her little fellas when Earl her husband of 52 years, pushed her wheelchair to the garden. Twyla chronicled her condition to me in her last Squiggles. 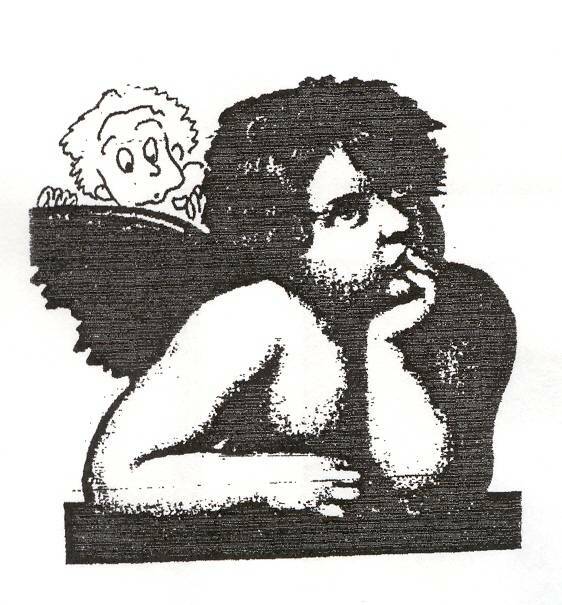 You can see it here, starting with "The Pain in the Back", to "The Sick Bed", "Looking Over an Angel's Shoulder", and finally, "Somewhere over the Rainbow". I will miss her.